Improve the skin colour, texture and wrinkles on your face without surgery – with 3 treatments in 1 session. The triniti skin series combines three of today’s most effective technologies for colour correction, fine wrinkle treatment and deep wrinkle treatment to achieve total facial renewal with minimal discomfort and downtime. 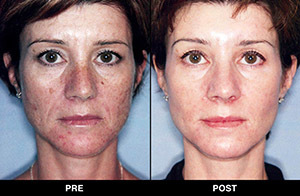 Colour Correction – the treatment of veins, age spots, uneven skintone and sun-damaged skin. ReFirm – target ageing sign, jowl and neck looseness, baggy eyes, saggy brow lines and nasolabial folds. 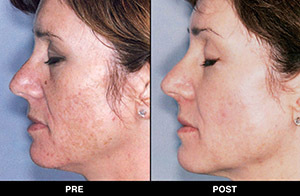 Matrix IR Fractional Wrinkle Treatment – makes wrinkles and skin texture feel smoother and more elastic. 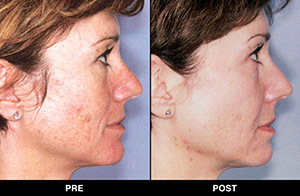 The 3 triniti treatment technologies use combined bi-polar radio frequency and light energies which precisely heat tissue within the targeted treatment area to stimulate improvement within the skin. Typically, three to five sessions spread three to four weeks apart. Touch-up sessions may be needed on a six monthly basis. Most people undergo the treatments with little discomfort. If preferred, we can offer topical anesthetic cream and external cooling which can improve your comfort level. Most people will see gradual improvements after each session. How long is each session duration? Total triniti treatment time is 40 – 60 minutes. If you’re having neck treatment too, allow an extra 15 – 30 minutes.